I originally bought it for Grant's fingernails because they get a little/a ton dirty when he is gardening. I thought I told him that, but I guess not. Because the next thing I knew, his usually dirty brown bathtub was suddenly clean! I asked him what had happened. Usually there is no thought of him cleaning that tub unless we have a guest coming. 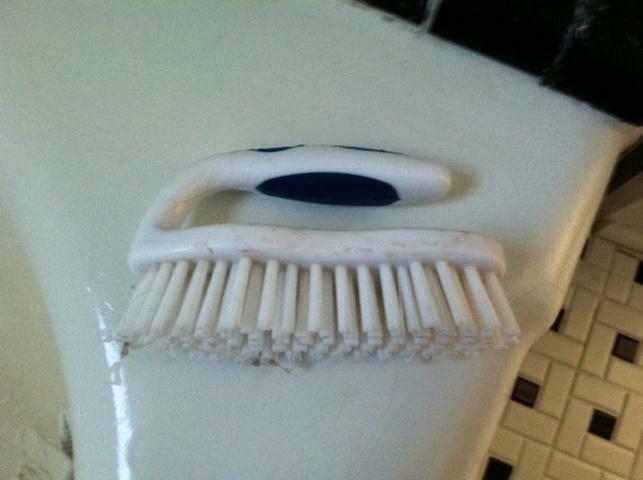 He said, "Oh this new scrub brush is great. I can just clean the tub while I'm showering." I wish I could take credit for this idea but I can't. But it is so effective and efficient that I got myself one too to clean my shower. I also got Grant another, smaller brush for his nails, but that has yet to be used or repurposed for a more genius idea. It's funny how things work out like that. And if you are looking for a maid for $4.99, this is your guy. Now, if only there was a way to accidentally invent a no-fuss cleaning mechanism for the rest of that bathroom!